KABUL, Afghanistan (CNN) -- Ten French soldiers were killed Tuesday in fighting near the Afghan capital of Kabul after 100 insurgents attacked a patrol, authorities said. French soldiers patrol in Afghanistan in May 2008. French and NATO authorities confirmed the deaths and said 21 other soldiers were wounded in the fighting in the Sarobi area in Kabul province, about 30 miles northeast of the capital. The clashes began late Monday afternoon and continued into Tuesday, when the casualties occurred, French officials said. French President Nicolas Sarkozy said his "determination is intact" to continue "this battle against terrorism for democracy and liberty." "The cause is just. It is an honor for France and its armies to defend them," said Sarkozy, who will travel Tuesday night to Afghanistan, the Defense Ministry said. Last month, nine U.S. soldiers were killed in fighting in eastern Afghanistan. U.S., British, Canadian and Dutch troops have been engaged in much of the combat in Afghanistan. The United States has been urging other countries in the NATO-led alliance to help ease the burdens of those troops on the front lines. 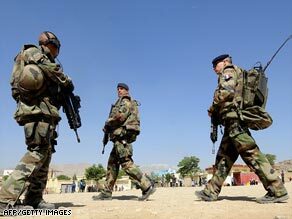 About 1,670 French troops serve in Afghanistan under NATO's International Security Assistance Force, according to ISAF's Web site. Before this incident, a total of 12 French troops had died in several incidents during the Afghan war, mostly in combat. As for the latest fighting, NATO said the initial patrol -- which included Afghan forces -- had been "reinforced with quick reaction forces, close air support and mobile medical teams." It said "a large number of insurgents were killed." Gen. Zahir Azimi, an Afghan Defense Ministry spokesman, said Tuesday that Afghan army forces rushed to the battle scene soon after the attack took place. He said 27 militants were killed and 14 were wounded in the fighting, and 13 of the bodies were recovered by the Afghan army. He said one of the dead militants was identified as a Pakistani national. The Taliban posted a Web statement saying its forces attacked an "American" convoy, killing 20 soldiers and destroying five military tanks. It also said foreign forces later Tuesday bombarded the region and killed five Taliban militants and several civilians. The fighting came after authorities tightened security on Monday in anticipation of militant attacks on the country's Independence Day. Several suicide bombers struck an American base about 12 miles from the border with Pakistan in Khost province on Tuesday, but U.S. and Afghan forces repelled the onslaught. Seven insurgents were killed in the attack on Forward Operating Base Salerno, including three suicide bombers who blew themselves up after forces from the base encountered them more than 3,000 feet from the base, ISAF said in a statement. U.S. and Afghan troops noticed the approaching militants by their "special behavior," the spokesman said. Helicopters flew in to attack them, the force said. ISAF said it suffered no casualties. Gov. Arsallah Jamal of Khost province said four commandos -- presumably Afghans -- were wounded when the militants struck late Monday. A Taliban spokesman, Zabiullah Mujahid, said 15 suicide bombers with small arms and machine guns entered the base and inflicted heavy casualties -- claims that the NATO-led force and Khost governor dismissed. That attack came after a suicide car bombing outside the same base killed 10 Afghan civilians and wounded 13 others Monday, the U.S. military said. Two other would-be bombers were killed before they could carry out attacks, Jamal said. Afghan forces stopped a second would-be car bomb near the base, performed a controlled detonation and detained a suspect, the NATO-led force said. This comes as a source from the Afghan Defense Ministry, who declined to be named, confirmed that Pakistani army chief Gen. Ashfaq Parvez Kayani arrived in Kabul on Tuesday morning to meet with Afghan and NATO military officials. In southern Afghanistan, a suicide bomber struck a Canadian foot patrol on Tuesday in the Kandahar province district of Panjwayee, local police said. The bomber and an Afghan interpreter for NATO forces were killed and a NATO soldier and a child were wounded, police said. The attack occurred as troops chatted with villagers in the district's main bazaar. The Taliban, in a Web statement, said 11 foreign soldiers were killed or wounded in the attack. CNN's Ben Brumfield and Journalist Farhad Peikar contributed to this report.